Are you invested in self-driving cars yet? If not, I hope you’ll read this issue carefully. And it isn’t some risky stock with unproven technology. It’s a dominant, profitable company that owns the “crown jewel” of the self-driving universe. And because of a rare situation in the markets, you can buy it today for practically nothing. As you read this, fully robotic self-driving cars are cruising around the suburbs of Phoenix, Arizona. The flat, wide roads and sunny skies there make for ideal driving conditions. Waymo’s Arizona robocar service already has hundreds of paying customers. And it’s in testing in another 25 US cities. 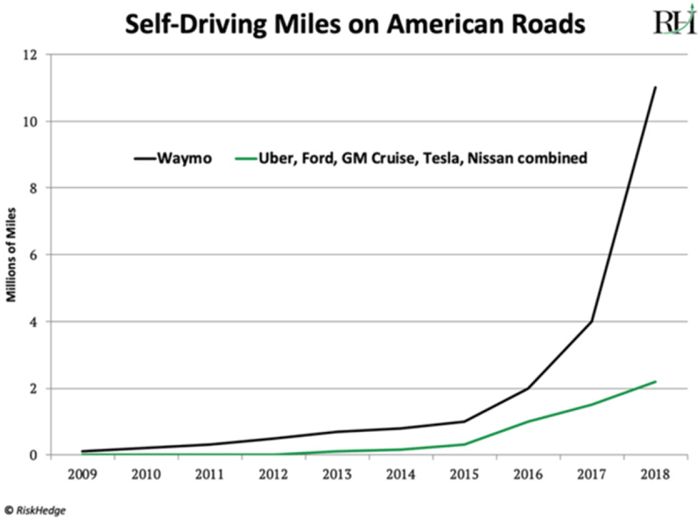 In the race to perfect self-driving cars, there’s Waymo... then a thousand-mile chasm... and then everyone else. This is key because its self-driving cars run on one centralized computer “brain” that learns from every mile driven. Waymo has run laps around its competitors for several reasons. But its biggest advantage is this: Waymo’s technology can “see” better than anything else out there. As we discussed recently, true self-driving cars must be able to reliably detect and interpret everything around them. Waymo has invested billions—likely far more than any of its competitors—to develop this ability. Its biggest breakthrough is the creation of cutting-edge LIDAR, which stands for Light Detection and Ranging. In short, LIDAR sensors measure distance with laser pulses. Tiny sensors that resemble a lawn sprinkler are affixed to the roof and front grill of the car. These sensors then send out roughly 160,000 pulses per second in all directions. These pulses can detect the smallest detail, like a leaf blowing in the wind. You might call LIDAR Waymo’s “crown jewel.” Insiders agree it’s hands-down the best LIDAR sensor available today. In fact, this tech is so important that competitor Uber allegedly tried to steal it by hiring away a key Waymo engineer in 2016. Having closely guarded its LIDAR secret technology for years… Waymo is now preparing to sell it to the world. Early last month, Waymo announced it would start selling its cutting-edge sensors to other companies in non-automotive industries. LIDAR has dozens of uses. For example, waste management companies are beginning to use it to collect trash and sweep sidewalks. Grocery giant Walmart (WMT) uses a LIDAR robot to stock the shelves. And John Deere (DE) equips some of its tractors with LIDAR so they can navigate through crop fields. In all, LIDAR sales topped $1.7 billion last year. Research from BIS Research estimates it will hit $5.8 billion in four years. As regular RiskHedge readers know, Google has quietly pumped billions of dollars into Waymo since 2009. Google keeps its total investment in Waymo a secret. But my independent research suggests it has invested well over $5 billion. In 2018, Waymo ordered 62,000 Chrysler Pacific minivans, which cost $2.79 billion alone. It’s finally “flipping the switch” to start harvesting profits from Waymo. As we’ve discussed, Google has formed a dozen or so disruptive offshoots separate from its core business of internet search. Waymo is one. Another you likely know well is YouTube. YouTube.com is the second most viewed website on earth, behind only google.com. In the past three years Google has pumped close to $15 billion into its disruptive offshoots. They all lose money. Together they’ve been a huge drag on Google’s profit. In 2018, they produced a $3.4 billion loss. Google was one of the first big American companies to invest in self-driving car research way back in 2009. Now, ten years later, it’s finally about to start reaping the rewards. But here’s the key that most investors overlook: Ten years is a long time to keep sinking cash into a money-losing program. Especially for a publicly traded company like Google. Google trades at 25-times earnings—near its lowest valuation since 2015. If you read last week’s RiskHedge Report, this number might sound familiar. It’s the same valuation that seller of “basics” Proctor & Gamble (PG) trades for. As a reminder, P&G is not growing at all. Google’s sales, on the other hand, have exploded 530% over the past decade. 25-times earnings is a good price for just Google’s extremely profitable core business of internet search. 92 of every 100 internet searches flow through Google. Markets are completely overlooking this. Keep in mind, Waymo is transforming from a business that burns billions into one that makes billions. As I mentioned, Waymo’s LIDAR is the best on the market. My calculations show within three years, it could easily make $2.5 billion a year selling its LIDAR systems alone. And that’s nothing compared to the huge opportunity is has as it expands its robocar ride-sharing service. Within three years, that should rake in roughly another $10 billion a year. I recommended buying Google at $1,070/share a couple of months back. Today it’s selling for $1,215/share. I see it hitting $2,000 in the next couple of years. Are you buying Google? Tell me at stephen@riskhedge.com. Did you miss out on the 500%+ profits investors made from Amazon, Netflix, and Nvidia? If the answer is "Yes," I have something for you... I uncovered three "disruptive" stocks set to double your money.